Composition of AIPs: Large datasets may be divided into multiple transfers prior to ingest, so that one dataset ultimately consists of a number of AIPs. See Hierarchical AIC/AIP structure, below. Metadata ingest: Metadata will be created outside of Archivematica prior to ingest, and may be referenced from the dmdSec of the AIP METS file as an xlink reference. See Metadata, below. Normalization: Some types of data files may require manual normalization: see https://projects.artefactual.com/issues/1499. DDI is Data Documentation Initiative, a metadata specification for the social and behavioral sciences; see http://www.ddialliance.org/. DDI and FGDC are considered descriptive metadata (dmdSec) in METS. 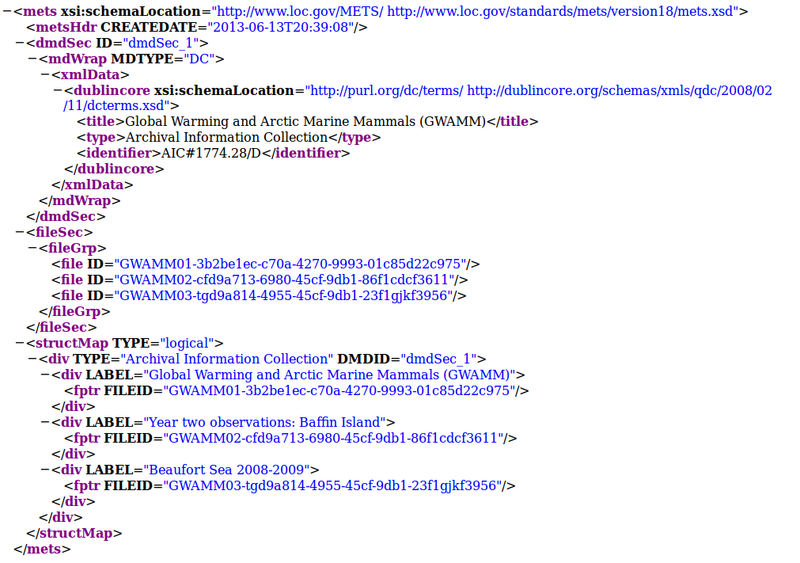 From http://www.loc.gov/standards/mets/METSOverview.v2.html: "Valid values for the MDTYPE element [in dmdSec] include...DDI (Data Documentation Initiative), FGDC (Federal Geographic Data Committee Metadata Standard [FGDC-STD-001-1998]." In the Archivematica METS file, a DDI or FGDC file could be referenced from the dmdSec using mdRef, for example as follows: <mdRef LABEL="CCRI-CDN-Census1911V20110628.xml-73b93b28-be1b-433f-861e-03bc321dfe7e" xlink:href="metadata/CCRI-CDN-Census1911V20110628.xml" MDTYPE="DDI" LOCTYPE="OTHER" OTHERLOCTYPE="SYSTEM"/>. Because datasets can be large and heterogeneous, one "dataset" may be broken into multiple AIPs. In such cases, the multiple AIPs can be intellectually combined into one AIC, or Archival Information Collection, defined by the OAIS reference model as "[a]n Archival Information Package whose Content Information is an aggregation of other Archival Information Packages." (OAIS 1-9). A basic AIC in Archivematica consists of 1) any number of related AIPs and 2) a METS file containing a fileSec and a logical structMap listing all the related AIPs. This screenshot shows sample metadata entry for the AIC (an AIP consisting of program/project-level metadata and documentation). The screenshot also shows the Dublin Core values that would be generated from the data entry. 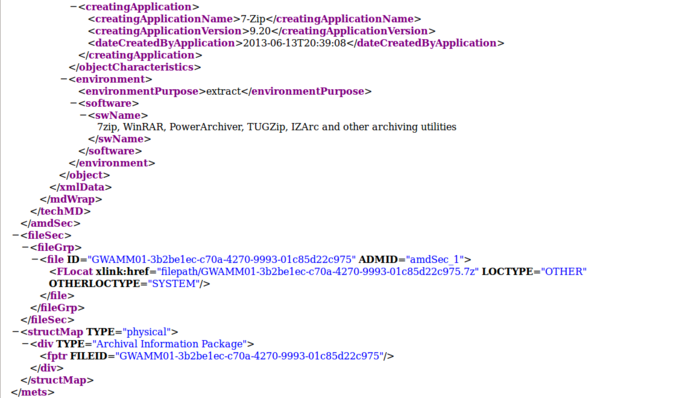 Note that that Dublin Core values would also be copied to the AIC METS file generated at the end of the workflow. 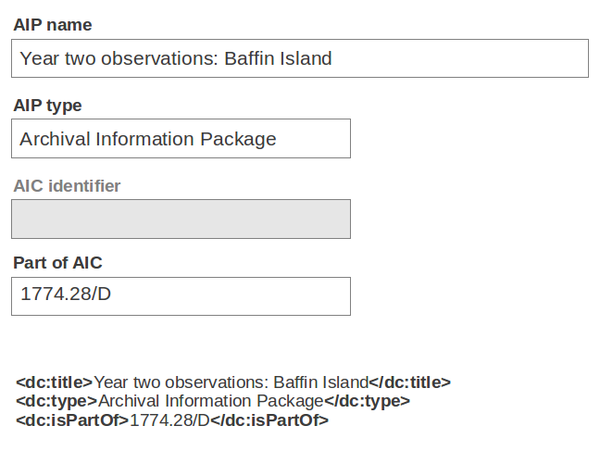 This screenshot shows sample metadata entry for an AIP (consisting of data files and associated metadata). The screenshot also shows the Dublin Core values that would be generated from the data entry. These values are saved in the AIP METS file but are not copied to the AIC METS file. This shows the AIC METS file which is generated at the end of the workflow. 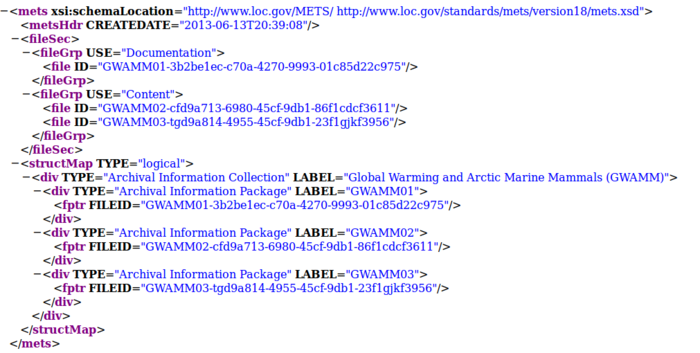 Note the Dublin Core metadata copied from the METS file in the AIC (the AIP containing program/project-level metadata and documentation). 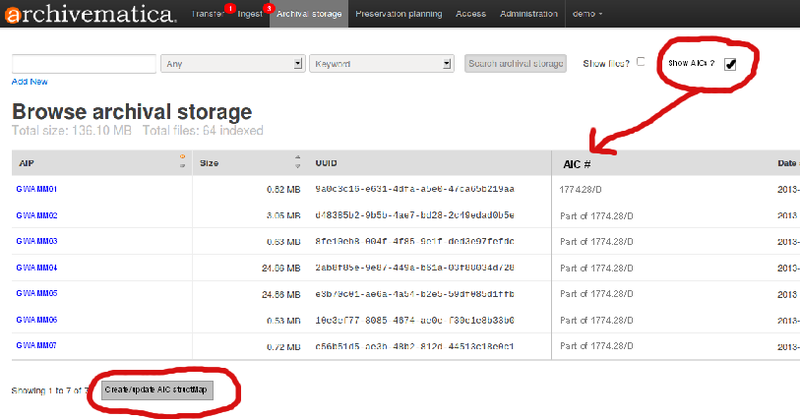 Once all the AIPs have been created and stored, the user searches for them in the archival storage tab. Selecting the "Show AICs?" box at the top of the screen causes an AIC# column to appear in the search results. The user then clicks on a "Create/update AIC structMap" button below the search results table. 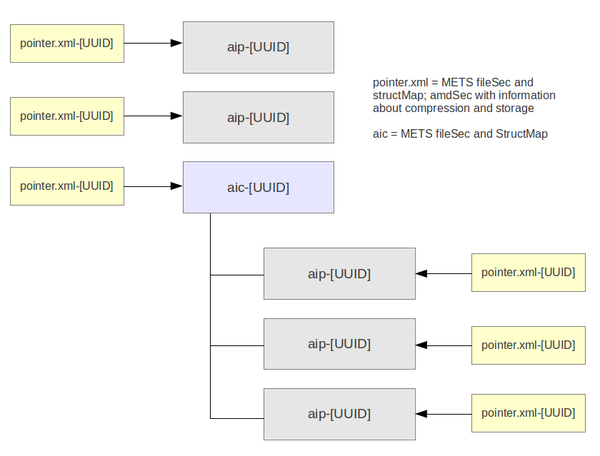 This diagram shows a storage area with standalone AIPs, an AIC METS file with child AIPs, and related pointer.xml files. Note that from a storage/data management standpoint, Archivematica considers the AIC METS file to be the AIC. Description: An AIC consisting of only a fileSec and structMap; AIPs consisting of data files and metadata for those data files; an AIP consisting of project/program-level (i.e. dataset) metadata and documentation. There is only a one-way link between the AIC and child AIPs - i.e. the AIC has a structMap listing all child AIPs, but there is nothing in a child AIP to indicate that it belongs to a given AIC. Over time, user can add new AIPs. Generate AIC structMap step can either replace structMap or update the old one. The process of creating an AIC first, then adding AIPs and having the system automatically add the AIC UUID to the AIP, would be complex and could not easily be built on existing code for generating AIP METS files. 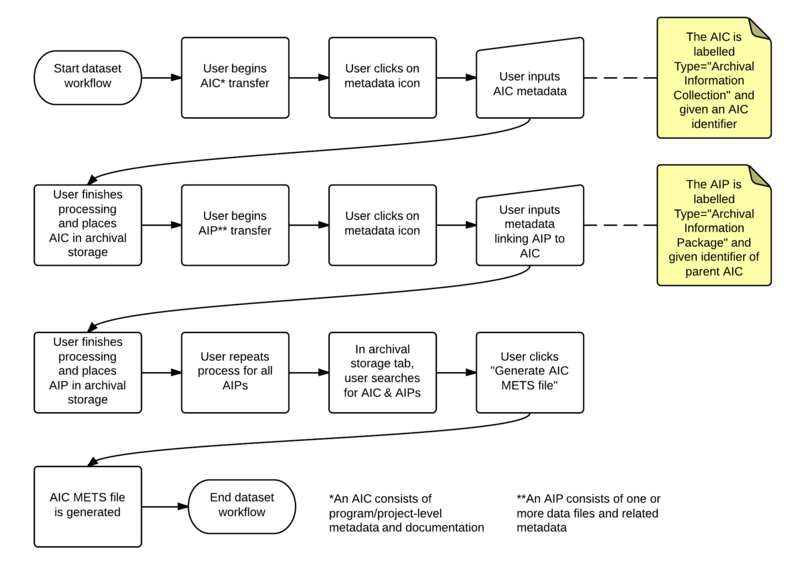 "System prepares the whole package for preservation (AIC/AIPs/structMap) and sends it to archival storage" - this does not match Archivematica's basic processing pipeline design, which generates AIPs and places them individually in archival storage. In reference to point 1, above, there would be no obvious mechanism for finding the UUID of the AIC and adding it to an AIP if the AIC has not already been placed in archival storage. "Over time, user can add new AIPs. Generate AIC structMap step can either replace structMap or update the old one" - it is not clear where or how this step would occur, since this would require searching for an AIC and its constituent AIPs in archival storage, then generating a new structMap from stored AIPs plus the AIP that is currently being created (and this process would need to be run separately for each new AIP). Updating the documentation AIP would be problematic if the documentation AIP doubled as the AIC. There is currently no mechanism for AIP versioning, and it is likely that "versioning" will actually mean creating replacement AIPs. In this case, updating the documentation would result in the creation of a new AIC with a new UUID, which would mean that all the AIC UUIDs in the child AIPs would become obsolete. Description: An AIC consisting of a METS structMap and project/program-level (i.e. dataset) metadata and documentation; content AIPs consisting of data files and metadata about the data files. 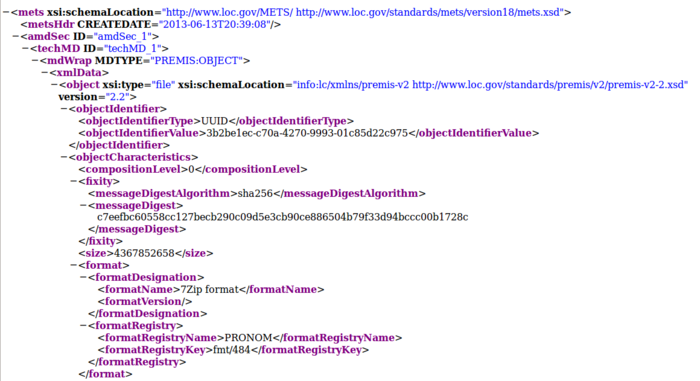 AIPs have information in the METS files (in the structMap?) linking them to the parent AIC. Description: An AIC with a unique identifier consisting of project/program-level (i.e. 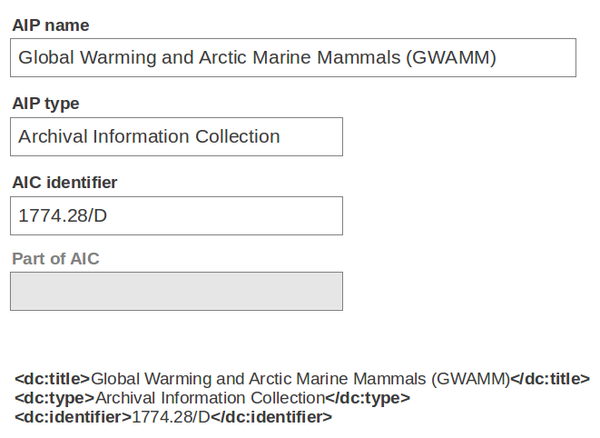 dataset) metadata and documentation only (no structMap); AIPs consisting of data files, metadata for those data files, and the same identifier as the AIC. The relationship between the AIC and AIPs in this scenario is inferred from the matching identifiers. This page was last modified on 23 March 2017, at 15:30.